It seems the internet is going cookie mad right now. My dear friend and food writer Edd Kimber is partly to blame - his cookies always make me drool. I’ve been dabbling with the dough myself recently, and these cookies, to quote my hyper-critical boyfriend, are “the best I’ve ever had”. I don’t disagree with him; they are certainly chewy, which is thanks to both the dried dates and the brown sugar. Mahlab is the ground pit of a black cherry, and its flavour is at the crossroads of almond and stone fruit. If you really can’t find it (though in this day and age the internet sells everything) then leave it out, but trust me when I say: it is worth the investment. These cookies also require you to make a brown butter, which is one of my favourite things to do. You simply melt the butter, let the water evaporate, then gently caramelise the milk solids. Of course, more detailed instruction will follow. Preheat the oven to 170C fan/190C conventional. Line a couple of baking sheets with baking paper. Put the butter into a medium saucepan and set over a medium/high heat. Allow the butter to melt as you swirl the pan every once in a while. When the butter starts to bubble, which is the water content evaporating, swirl the pan more frequently - every 30 seconds or so. The bubbling will be fierce and noisy, like heavy rainfall, accompanied by large, irregular bubbles. After a short time, everything will fall silent and a fine, cappuccino-like foam will fill the surface of the liquid gold. Remove the pan from the heat and pour the brown butter into the bowl of a freestanding electric mixer fitted with paddle attachment. Allow to cool for 5 minutes, then add the sugars and beat for 5 minutes. Add the egg and beat to combine, which should make the mixture transform from a grainy mush to a velvety slick. Add the flour, mahlab, bicarbonate of soda, baking powder and salt and beat to a thick dough. Throw in the chopped chocolate and dates and beat until evenly combined. Divide the dough into 18/19 portions (I got 19, annoyingly) each weighing 45g and roll into balls. Put the balls of dough, well-spaced, onto the baking sheets. I’d err on the side of caution and put fewer balls of dough than you feel comfortable with - there’s nothing worse than a batch of beautiful cookies spreading into one clump. If you have to bake the cookies in batches, do so. Bake the cookies for 15 minutes. They will still be slightly swollen up, so press them down a little (I just use the back of a spoon), then allow to cool on the baking sheets. For Mother’s Day this year, I’ve decided to break away from tradition. I won’t be baking a cake that is sharp with lemon or floral with rose - in the stereotypical feminine fashion - but instead I shall be embarking on a more gutsy mission with this banana bread. The tender cake is topped with a peanut butter, bacon fat and cream cheese frosting, finished with caramlised bacon and dark chocolate. The peanut butter and bacon is inspired by Elvis’ famous (or infamous, depending on your perspective) sandwich - fried with bananas, peanut butter and bacon. It is a combination that on paper is so wrong, but in the mouth it is so right it reduces you to rapture. A cake inspired by the King, made for the Queen of my family. First cook the bacon. Line the rashers on a baking sheet and put into a cold oven. Turn the oven on to 180C fan (200C conventional) and cook for 15-20 minutes until crispy. Drain the bacon fat into a small container to be used for the frosting. Reduce the oven to 150C fan (170C conventional). For the cake put the butter, sugar, mashed bananas, sunflower oil and peanut butter into the bowl of a freestanding electric mixer fitted with paddle attachment and beat until well mixed - a good 3 minutes. Add the bourbon if using, and the egg and beat until incorporated - don’t worry if it all looks a little split at this stage. Sift in the flour, bicarb, nutmeg and salt, then beat to a reasonably smooth batter. Tip the batter into the prepared loaf tin and bake for 60-75 minutes, until a skewer inserted into the centre of the cake comes out clean. Meanwhile, chop the bacon into small pieces and have a piece of baking paper handy. Set a small saucepan over a medium-high heat. Once the pan is hot add the 50g caster sugar and allow to melt and brown to a dark caramel. Add the bacon pieces and stir to combine, then tip out onto the piece of baking paper. Allow to cool completely - it will become very brittle when cooled. When the cake is baked, allow to cool completely before making the frosting. For the frosting, beat the butter, icing sugar and hot water until pale and fluffy - I do this with a handheld electric beater because the KitchenAid is a little big for this small quantity. Add the cream cheese, bacon fat and peanut butter and beat for a good minute until fluffy and smooth. Spread the frosting onto the cooled cake, swirling it as you see fit (are able). Chop the caramelised bacon into bite-sized nuggets, and scatter on top of the frosting along with the chopped chocolate. This cake, unfrosted, will last for a good week in a very airtight container, or for a good 6 months wrapped in clingfilm and stashed in the freezer. If your bananas aren’t ripe enough, don’t panic. Just preheat the oven to 180C fan (200C conventional) and put the bananas onto a baking sheet. Bake for 20 minutes, or until completely blackened. Allow to cool then peel and mash as instructed. Gird your jowls, because this is lemony. I find that lemon desserts can be so disappointingly sweet, but this lives up to its name. This is a combination of two of my favourite desserts, and it's a union that is most holy. You may notice that in the recipe I weigh all of the liquids - this isn't a typo. I find it far more accurate to weigh absolutely everything. For the pastry, put the butter, sugar and lemon zest into a bowl and beat until pale and fluffy - treat this as though you were making a cake. It may seem bizarre to warm the butter for pastry, but trust me, this is the best sweet paste I have ever made. When the butter and sugar are well combined, add the flour and cut that in using a butter knife or dough scraper, until the mixture resembles damp, coarse breadcrumbs. Beat the egg in a small bowl, then add it to the flour mixture and cut that in until the mixture starts to clump together in large boulders. Plonk the pastry down onto the worktop, knead very briefly until it just comes together, then wrap in cling and flatten into a disc. Pop into the fridge and chill for at least an hour. WARNING: the pastry will be very soft, but that's normal. Just work quickly and get it in that cling without poking it too much. When the pastry has chilled, dust the worktop liberally with flour. Roll the pastry, turning it 90 degrees after every few turns, into a disc that's slightly larger than the tart ring/tin. Set the ring/tin onto the baking sheet, then line with the pastry. Make sure you press the pastry into the corners of the ring/tin so that the sides are perfectly upright - I leave the surplus pastry hanging over the edge until baked. Prick the base of the pastry repeatedly with a fork. Rip off a large piece of baking paper, scrunch it up, then unravel it and line the pastry case with it, then fill that with baking beans. Bake the pastry case for 15 minutes with the paper and beans, then remove the paper and beans and bake for a further 15 minutes. When the pastry case has cooled, saw off the overhanging surplus with a serrated knife. Only when the pastry case is baked and has cooled should you start on the filling. For the curd, put the lemon juice, butter, zest and half of the sugar into a medium saucepan. Put the egg yolks into a mixing bowl and whisk, with the remaining sugar, until slightly aerated - about a minute. Add the cornflour and whisk that in too. Bring the pan of lemon juice to a boil, ensuring the butter melts in it, then pour the lemon juice onto the egg mixture while you whisk constantly. When well combined, pour the mixture back into the pan - off the heat - then return the pan to a high heat and whisk constantly. If you stop whisking you'll end up with a scrambled mess, so while the pan is on the heat you've got to whisk. When the mixture starts to bubble, continue whisking for a minute, then pour it straight into the baked pastry case. Don't poke it or mess with it, let gravity do its job and the curd will flatten. Refrigerate for at least 4 hours, though overnight is much better. When you're ready to serve the tart remove it from the fridge and sprinkle the Demerara sugar over the top as evenly as possible. If you own a decent chef's blowtorch, torch the top until the sugar melts and burns in a mottled, almost giraffe-print pattern. If you haven't got a chef's blowtorch, preheat the grill to high then set the tart underneath - do not take your eyes off it, as it could burn in a heartbeat. Serve. A bundt cake, in all its bouncy glory, will stop any show - if, of course, you can get the bugger out of the tin. Follow my tin preparation method below and that should bring you success every time. It has happened to most of us: a perfectly-baked bundt which we have to prise, with bated breath, from a bloody bundt tin. Grease spray doesn't cut the mustard, oiling alone doesn't achieve anything, and margarine is a disaster waiting to happen. What the bundt needs is a butter, butter, flour preparation. Melt a little butter (about 50g or so) in a saucepan over a medium heat. Once the butter is melted brush a thin layer into the bundt tin, ensuring you cover every single nook, cranny and crevice. Put the tin into the freezer for a minute, butter again, then sift over a dusting of flour. Shake the pan about a bit, to cover every single inch with flour, then tap the excess flour out. Put the butter and sugar into a KitchenAid fitted with paddle attachment and beat until pale and fluffy. Add the eggs a little at a time, beating well after each addition. If the mixture splits just carry on and ignore it. Add the buttermilk in 4 inclusions, beating after each addition. If the mixture hasn't already split, it most likely will now, but keep your head held high and sing a happy song as you throw in the vanilla bean paste. Into a separate bowl sift the flour and bicarb. Add the flour to the mixer in three inclusions, beating gently after each addition, just until incorporated. As soon as the flour is all in, and you have a smooth batter, stop beating. Divide the mixture as evenly as possible between 2 bowls. In a small ramekin put the cocoa powder and hot water, and beat until smooth. Add the cocoa powder mixture to one of the bowls containing cake batter and fold in until evenly incorporated. Blob the batters into the tin with a tablespoon, alternating between plain and chocolate. Once all of the batter is in the tin, take a knife and run it all the way around the tin, deep in the batter, twice. Bake the bundt for an hour, until a skewer inserted into it comes out clean, and the gentle crackling bubble sound of baking has more or less subsided. Leave the bundt in the tin for 15 minutes, then give the pan a good shake back and forth, before inverting it onto a wire rack. The cake should fall out. If it doesn't, you may need to gently fiddle between the cake and tin with a small palette knife. Allow to cool completely. For the ganache, set the chocolates into three separate bowls. Put the cream into a saucepan and set over a high heat. Once the cream comes to a boil, pour it, in thirds, over each chocolate. Leave for thirty seconds, then whisk to smooth, glossy ganaches - if you start with the white chocolate, then you don't need to wash your whisk after stirring. If the ganaches still contain little bumps of chocolate, set them over a pan of barely simmering water until smooth. Pour the ganaches, randomly, over the bundt, allowing the ganache to mix, mingle and marble together as it drips down the sides of the cake. At my local farm shop recently, I was prepared to knock even the frailest of shoppers to the floor to guarantee myself a bundle of deep pink Yorkshire rhubarb. I'm obsessed with the stuff. Its lure superseded that of sweets to my younger self when I first cooked some down to top a bowlful of rice pudding. Yorkshire forced rhubarb is a treasure to find, and aside from its perfect colour and taste, its provenance dresses it with romantic mystery. To ensure its rose-tinted hue, Yorkshire forced rhubarb is grown in the dark, and harvested only by candlelight. With each mouthful, I imagine the workers picking it, as shadows from the candles flicker and dance against the barn walls. 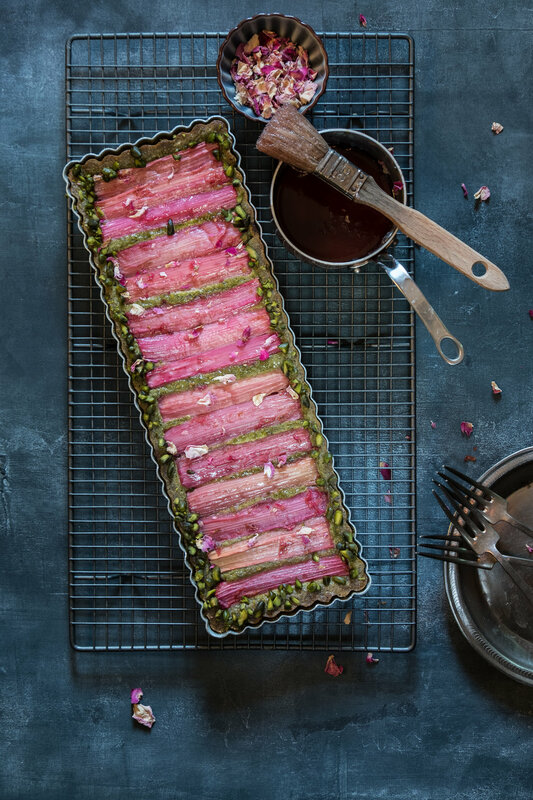 Slice the rhubarb into lengths that are just a couple of centimetres shorter than the width of the tart tin. Set them aside. Put the sugar, water and port into fairly wide-based saucepan and bring to a boil. Once boiling reduce to a simmer and add the rose water to taste (don't burn your mouth!). Add the rhubarb and simmer just for 5 minutes, until tender but the shape is still intact. Remove from the syrup immediately and set onto a plate or tray. Do not throw the syrup away. Put the pistachios onto a baking tray and roast for 10 minutes, then remove and allow to cool. Grind the cooled pistachios in a spice or coffee grinder (I use my nutribullet) until very fine. Put the ground pistachios into the bowl of a KitchenAid fitted with paddle attachment, along with the sugar, butter and flour. Beat until smooth, then add the eggs, one at a time, until you have a smooth cake batter. Scoop the batter into the greased tin and level off, then layer the poached rhubarb pieces on top - if they're a little limp, it's best to transport them with a small offset spatula. Bake the tart for 35-40 minutes, until set with a very slight golden brown colour around the edges - though it should mostly be a startling green. While the cake bakes, boil the poaching syrup until it is thick like honey. As soon as the cake comes out of the oven, glaze it liberally with the syrup. Finish with some chopped pistachios and rose petals. When you put carbs onto carbs, you just know the result is going to be a successful one. And when you throw cheese and cream into the works, well that combination just speaks for itself. I’ve only once seen, and indeed tried, Tartiflette pizza. It was my birthday and my partner and I found ourselves in Castellane, not far from Nice in the south of France. We had driven through the mountains from Nice to find a place to white water raft. In this quiet little town we sat outside an empty restaurant, warmed by an electric heater, and devoured two of these. Tartiflette is a hearty potato dish from the Savoy region made with the local cheese, Reblochon, and is designed, no doubt, to keep out the cold. Served as a pizza topping it is comfort food at its best. For the dough simply combine the ingredientsin a large bowl and mix until everything comes together to form a scraggy mass. Knead the dough either by hand for about 10 minutesor in a mixer fittedwith a dough hook for 5 minutes. It’s absolutely crucial that you don’t add any more flour. This dough will be quite wet, and that is precisely right. Not a single grain more! As soon as the dough is smooth and elastic, it is ready. Put the dough into a greased bowl and cover with cling film. Leave to rest until doubled in size. Meanwhile, make the topping. Heat a large frying pan over a high heat and once hot add 1 tablespoon of sunflower oil and the bacon and onion. Reduce the heat to medium and allow the bacon to cook until fairly crispy, and the onion is soft and a little browned. Tip into a bowl and set aside until needed. Return the pan to a medium heat and add another 1 tablespoon of oil along with the butter. Add the potatoes and garlic cloves to the pan and leave to cook slowly for about 25–30 minutes, tossing the pan occasionally. This may seem like a long time, but it’s better to cook the potatoes over a lower heat for longer, to achieve an unrivalled inner tenderness and outer crispiness. Once the potatoes are cooked, turn the heat to high and add the wine, allowing it to bubble and evaporate completely. Add the cream and cook it until thickly reduced – don’t worry if it splits. Stir in 1 teaspoon of salt and pepper, remove and discard the garlic cloves, then remove from the heat and add to the bowl with the bacon and onion. Roughly chop half of the cheese and add it to the bowl. Preheat the oven to 250°C/230°C fan/gas mark 9, and place a baking sheet or pizza stone into the oven to get hot. Once the dough has doubled in size, dust a second baking sheet liberally with flour and roll out the dough to a disc about 23cm in diameter. Check the disc of dough isn’t stuck down to the baking sheet – give the sheet a quick jerk back and forward to ensure the disc moves freely on the flour. Scatter the Tartiflette mixture over the dough, slice the remaining cheese and add that, then slide the pizza off the cold baking sheet and onto the hot one in the oven. Bake for 7–10 minutes until the edge of the pizza is puffed up and golden. Serve immediately. My friend Stacy from New York recently came to stay for the weekend. Time passed quickly and with much greed; I introduced her to the hearty lancashire fare on which I was reared: fish and chips, parkin, Lancashire cheese, and unashamedly, a takeout curry. I don't think I've eaten so much over the course of a weekend since I was a sugar-fuelled child, rapaciously raiding the biscuit tin. Stacy, who is so petite, managed just a quarter of her fish and chips, but she gave it a jolly good go - she'll need to expand her stomach before her next visit in October. Bizarrely, we hardly cooked or baked, but these gleaming golden buns (along with the best potato, cheese and onion pie I've ever made) were delicious. Mahlab is the ground kernel from the cherries of a particular tree and is commonly used in Greek and Eastern festive cooking and baking. Its flavour is something of a muted marzipan, with a hint of floral cherry. Click here for stockists. First make the dough. Put the flours into a bowl and toss through the yeast, salt and sugar. Put the milk into a saucepan and set over a high heat, heating just until the milk feels slightly warm on the finger. Add the butter - don't worry that it won't melt completely - then pour into the dry ingredients along with the egg. Using your hand, a wooden spoon, or, if you have one, a KitchenAid with dough hook attachment, work the ingredients into a fairly wet dough, then knead until it is elastic. The time in which it takes to achieve this depends on so many variables: the speed and the action to name a couple. The best test for a sufficiently kneaded dough is to flour your fingertips extremely well, then grab a cherry-sized chunk of dough, dipping that in flour to coat. I then hold the dough with my thumbs and forefingers, and with my middle and ring fingers I gently (and I mean very gently) 'tickle' the dough to stretch it until it becomes a very thin membrane. There may be the odd small tear here and there, but for the most part the dough will be a thin 'window pane'. If the dough tears severely, springing back, it means sufficient gluten hasn't been formed, so just keep kneading. Once the dough is kneaded, put it in a bowl, cover with cling film, and leave out at room temperature to double in size - this may take an hour or many more, depending on how warm the room is. Just be patient and get on with something else. When the dough is almost doubled in size, get on with the filling. This is just a case of mixing everything except the apricot pieces together into an almost impossibly smooth, spreadable paste. I find the most successful (and satisfying) way is to use my hands. Just cream everything together and the heat of your hand will make it much quicker and more evenly amalgamated. Grease 2 large baking sheets with butter in preparation for the knots. Roll the dough out on a floured surface to a rough square of about 45cm. Spread the paste evenly over the dough using a small crank-handled palette knife or the back of a spoon, then sprinkle over the apricot pieces as evenly as possible. Fold the dough in half, starting with the edge closest to you. Press the dough down gently, then roll it a little more just to work the paste in. Here I recommend you put the dough onto a third baking sheet and into the freezer for 15 minutes to stiffen it a little, which will make it easier to shape the knots. Trim the two ends and discard (or bake off later as chef's perk). Cut the dough horizontally into 16 equal(-ish) strips 2.5-3cm in width. To shape, take a strip of dough. 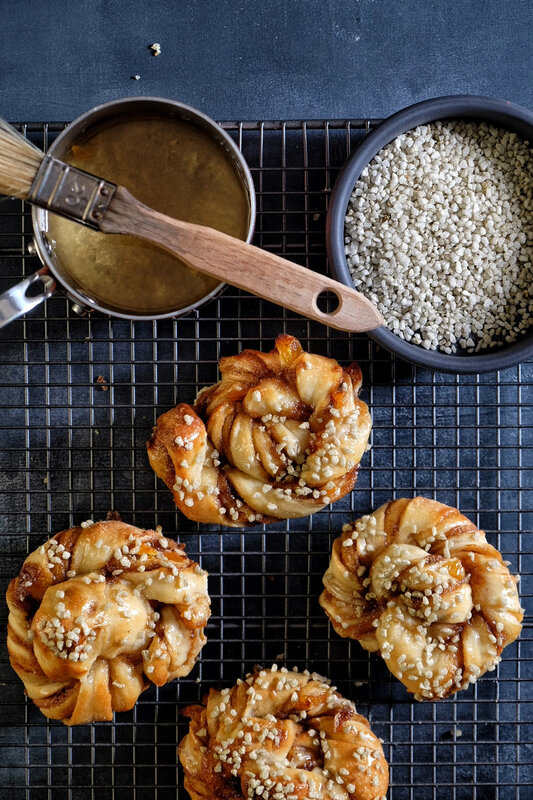 Hold each end and twist to spiral the dough neither loosely nor tightly. Once the dough is spiralled, hold one end of the strip between the forefinger and middle finger of your non-dominant hand, then wrap the strip around those same two fingers, tucking the end into the twist to knot it. It takes a little getting used to. Place the knots well-spaced on the baking sheets and allow to rest until they feel almost jelly-like. They will turn from dense little knots into swollen and aerated (slightly larger) knots, so take a mental note of how they feel just as you've shaped them. Preheat the oven to 220C/200C fan/gas mark 7. To make the glaze, simply put the sugar and prosecco into a saucepan and stir to dissolve. Bring to a boil and cook for 2 minutes (or, if using a sugar thermometer, until the temperature reaches 106C). Add the lustre and stir to combine - this will resemble liquid gold. Once the buns are swollen, bake for 8-12 minutes, until lightly golden. Remove from the oven and glaze immediately using a pastry brush. Sprinkle each knot with pearled sugar (if using) just after glazing. Allow to cool, to at least an edible temperature, before serving. Preheat the oven to 150°C fan. On each of the lined baking sheets, draw a circle of 23cm/9-inch diameter. An easy way to do this is to draw around a 23cm cake-tin base. Place the egg whites in a metal mixing bowl, or freestanding electric mixer fitted with whisk attachment, and whisk the whites until stiff. Slowly add the sugar, a tablespoon at a time, while whisking on medium speed, until all the sugar is in and is dissolved. You can check by rubbing a little of the mixture between your fingers; if it feels gritty, it needs more beating. Turn off the mixer and fold in the ground almonds. and spiral out until you have a large, flattish disc. Do the same with the other. Place in the warm oven, immediately turn the temperature down to 130°C and allow to dry out for 60 minutes. After 60 minutes, turn the oven off but leave the discs in there until cool, with the oven door slightly ajar. When cool, peel off the paper. Place one disc on a large flat plate, upside down: in other words, with the side that was in contact with the paper facing up. Whip the cream to soft, floppy peaks and fold in the liqueur. Dollop this boozy cream on to the disc and spread out evenly. Beat the apricot jam with a spoon until loose, then drizzle over the cream. Crumble the Amaretti biscuits over the top, then finish with the second disc, the right way up. Every year I make a batch or two of damson jam. It's a therapeutic ritual and somewhat grounding; there's something rewarding and gratifying about taking the time and care to forage the fruits. Taking the stones out is the most tedious part, but it's just a case of skimming them away with a slotted spoon as the fruit breaks down. They lurk just beneath the surface like sharks in a blood-red pool. Last year my flavour of choice was damson and liquorice, a jar of which is still safely stashed in my cupboard, away from thieving hands. This year is something a little more experimental, and the results are weird and truly wonderful. The jam will keep for months, if not years, but sterilised jars are a must. Simply run them and their lids through a hot cycle on the dishwasher, allow them to dry, then remove them. Failing that, wash the jars and lids in hot, soapy water, then put them onto a tray and into the oven at 140C/120C fan for a good 30 minutes. However you sterilise them, once it's done, don't even think about touching the inside of either jar or lid. The only test I trust for setting point is temperature. I use an instant read digital thermometer to ensure the jam is 105C, and I always stir the pot before taking a reading to ensure an even temperature. When it comes to yield it's impossible to be too prescriptive. The quantity below filled 6 regular sized jam jars. Have 8 handy, just in case. Put the damsons and the Guinness into a large saucepan and set over a high heat. Stirring, allow the contents of the pan to come to a boil, then reduce to a quick simmer and cook, stirring occasionally, until the fruit has completely broken down. It's tempting to skip this part, but trust me, it'll make your life easier when it comes to skimming the stones. Add the sugar to pan and stir to dissolve. The stones (and some skins) will float to the surface. Remove the stones with a slotted spoon or kitchen spider. Sift the cocoa powder into a small bowl and stir together with enough of the damson liquid to create a thick paste. Pour the paste back into the jam pan and stir to incorporate. Bring the jam to a boil and cook, stirring occasionally, until it reaches 105C. And it bears repeating: stir the jam before you take a temperature reading. Decant the jam into the sterilised jars and pop on the lids. Allow to cool and set. Don't forget to label; I once opened (admittedly after a few drinks) what I thought to be jam. It turned out to be a far too spicy Christmas chutney. It wasn't at all pleasant on my midnight toast. Damson cheese is a very thick paste made from damsons and sugar. It sets to a thick jelly, like a soft fruit sweet, and can be sliced to accompany actual cheese. It's also ideal as a petit four if cut into bite-sized cubes and rolled in caster sugar. Or, as recommended by queen of preserves Vivien Lloyd, dip cubes of it in melted chocolate for a confectionary not too dissimilar to, but far more tempting than, chocolate-covered Turkish delight. Grease and line with baking paper a 20cm square cake tin. Lightly grease the baking paper, too. Put the damsons into a large saucepan with a splash of water and bring to a boil. Reduce to a quick simmer and cook, stirring occasionally, until the fruit breaks down. Set a sieve over a large bowl and put the damsons - in batches is sensible - into the sieve. With a wooden spoon, beat and press the damsons so their puree falls down into the bowl. Discard the skins and stones. Weigh the puree. *For every 500g/ml puree, you need to add 350g caster sugar. Add the sugar and bring to a boil, then reduce to a simmer and cook, stirring very frequently - especially as it thickens - until so thick that when you draw a wooden spoon across the pan, the the base of the pan peers through for a second. Pour the damson cheese into the cake tin and allow to cool and set for a few hours. To portion, lightly grease a chef's knife and chopping board and cut the damson cheese into slabs of whatever size you fancy - I wear blue gloves to avoid marking the cheese with fingerprints. Wrap in parchment and store in the fridge. Crisp and sunny mornings, and the crunch of dried leaves underneath your feet: these are the things that epitomise, and excite me most about, autumn. It's the beginning of our hibernation. We harvest the fields and take stock of what the year has given us. We pickle and we preserve, and we prepare for months of little yield. Most thrillingly - and perhaps a vast antithesis to the grateful gathering - we begin to let loose and indulge. Pumpkin spice lattes are my guilty pleasure, so when Baileys released their Pumpkin Spice, I had to get down to work. Preheat the oven to 160C fan/180 conventional/gas mark 4. Grease a 23cm springform tin and line the base with baking paper. For the base, put the biscuits into a food processor fitted with blade attachment and add the butter. Blitz to a damp sand consistency, then tip into the prepared tin and press down to compact evenly. Bake for 15 minutes, then remove from the oven and allow to cool completely. If you don’t have a food processor, put the biscuits into a bag and bash them to a fine crumb. Melt the butter and allow to cool, then combine with the biscuit crumbs in a mixing bowl and continue as above. Meanwhile make the filling. Put the cream cheese and sour cream into a freestanding mixer fitted with paddle attachment, and beat until smooth. Add the sugar and eggs and beat again, then add the remaining ingredients and beat until smooth. Pour the filling over the cooled base and bake for 20 minutes, then reduce the oven to 140C fan/160C conventional/gas mark 3 and bake for a further 50-60 minutes. The cheesecake should be set with a slight tremble in the middle. Allow the cheesecake to cool to room temperature – don’t worry if it cracks a little. Increase the oven to 160C fan/180C conventional/gas mark 4. For the topping, mix together the sour cream, sugar and Baileys. Pour the mixture over the cooled cheesecake and bake for just 15 minutes. This will set the sour cream. Allow to cool completely, then chill overnight, or for at least 4 hours. To finish, whip the cream to soft, floppy peaks, and spread it over the top of the cheesecake. Decorate with the gingernut crumbs, bay leaves, cinnamon sticks and cloves – don’t forget to tell those eating it to remove the decorations before eating it, unless they’re partial to the mouth-numbing qualities of clove. Richard Bertinet recently taught me a really valuable life lesson: how to pit a cherry without removing the stalks. The answer lies in a paperclip. These brownies not only look so delicious, but the cherry really helps to balance that sweet, gooey, chocolaty goodness. To pit the cherries, take a paperclip and unbend it, leaving the hook shaped part as a hook. Insert that hook up into the base of a cherry. Feel the way around the stone - I think it helps to imagine you're shaving the stone with the paperclip. Gently manipulate out the stone, being careful not to squash the cherry or remove too much flesh. Place them wound side down onto paper towel. Preheat the oven to 200C/180C fan. To make the brownie batter place the chocolate and butter into a saucepan and set over a low heat. Stirring constantly, melt them together until very smooth and shiny. Remove from the heat and add the eggs and beat in until smooth, then beat in the sugar until it is more or less dissolved. Sift over the flour and fold in along with the chocolate chips until you have an evenly smooth batter. Pour the batter into the prepared tin and bake for 15 minutes. Remove from the oven and press the cherries into the mixture as evenly spaced as possible, leaving their tops and stalks poking out. Return to the oven and bake for a final 15 minutes. When ready, the brownie should be a cracked, paler brown on top, and dark brown, dense and gooey underneath. Allow to cool until completely cold, then chill in the fridge before cutting - this just helps to achieve an even, neater cut. This is one of my all time favourite flavour combinations. It's based around the liquorice chocolates I enjoyed in Stockholm a few years back, and since then I've been making this cake often. Its current permutation is somewhat of a showstopper, and is perfect as an occasion cake - though in my view, this cake is a cause to celebrate in its own right! In a heatproof jug, mix together the dark muscovado sugar and boiling water until the sugar has dissolved. Leave to one side until needed. In a mixing bowl or KitchenAid fitted with paddle attachment, beat together the butter and caster sugar until well mixed. Add the eggs, buttermilk and cocoa powder and beat until smooth. Sift over the the flour, liquorice powder and bicarb, and fold in until smooth - this will be a very thick batter. Then slowly pour in the muscovado/water mixture and beat just until incorporated - don't overmix this. Divide the batter between the two cake tins and bake for 25-30 minutes, until a skewer inserted into the centre comes out clean. Allow the cakes to cool in the tins for five minutes, then invert onto a wire rack. The cakes will look a little cracked on top, but don't worry. For the ganache heat the lozenges and water in a medium saucepan over a high heat. Stir constantly until the lozenges more or less dissolve into the water. Add the cream and reduce the heat to medium. Put the chopped chocolate into a heatproof bowl, and once the cream starts to simmer around the edge pour it over the chocolate. Leave the cream to melt the chocolate for about thirty seconds, then beat to a smooth, glossy ganache. Pour onto a large, clean, deep-sided baking tray, and allow to cool until thick but spreadable. Meanwhile, slice the tops off each cake to level (reserve the crumbs for sprinkling), then slice each cake in half so you have four equal layers of cake. To assemble, place the cake card onto a cake stand (I use a cake decorating turntable at this stage) and place a layer of cake onto that. Spread over a little ganache - you don't want this to be too thick a layer, just a reasonable spread. Repeat with the remaining layers of cake until you have four layers of cake sandwiched together with three layers of ganache. Spread the remaining ganache over the top and sides of the cake. I use a small, crank-handled palette knife to get a really neat top and sides. When you're happy with how neat the cake is, place into the fridge to chill for 20 minutes. When the cake has chilled, chop a selection of the sweets and arrange these into a neat line about one third of the way across the cake. Sprinkle over a few cake crumbs - be delicate here - and the masterpiece is ready to serve. For those moments of solitude and peace, these eggs are a must! And, to ensure your moment is completely personal to your own palate, they can be easily customised (I love a drizzle of truffle oil and a generous grating of Parmesan cheese). Grease a short fat teacup or ramekin with butter and break the eggs into it; do not break the yolks. Gently pour on the cream or milk, and sprinkle with thyme, salt and pepper, then put the grated cheese on top. Don’t stir anything. Place the cup or ramekin into a deep sided baking tray and fill the tray with hot water so that it comes halfway up the ramekin. Bake for 12–14 minutes, so that the white is just set, and the yolk is perfectly runny. I love tarte tatin. What I especially love is the fact that you can experiment and use different fillings – or toppings, rather – and achieve some lovely flavours. This is one of my absolute favourites, and can be served at any time of the year, though it feels far more fitting during the chilly autumn months. Start by making a spiced caramel. Put the water, sugar, cinnamon, cardamom pods and star anise into a 24cm/9in ovenproof frying pan. Stir until the sugar dissolves, then set over a high heat and allow to boil away until dark golden - you must not stir this or it will crystalise. This usually takes about 3-5 minutes. Meanwhile, peel the pears and cut in half lengthwise. Remove the core with a melon baller or small spoon, leaving the stalks intact. Put the pears into a bowl of water.Once the caramel is dark golden, add the butter cubes, but still don’t stir, and remove the pan from the heat. Remove the spices with tongs, saving them for later. Place the pears on the caramel – being careful not to burn your fingers – hump sides down, with their fat bottoms out towards the edges of the pan. Roll the pastry to about 4mm thick, and cut out a circle about 2.5cm bigger in diameter than the frying pan. Place the pastry on top of the pears and tuck it down the sides using a wooden spoon. Stab a few holes with a sharp knife, then place the frying pan in the oven and bake for 30 minutes, or until the pastry is a glorious golden brown and has puffed up. To serve, remove the frying pan from the oven. Take a plate that is larger than the pan, and place it top-side down on the pan. Wearing oven gloves, or shielding your arm with a tea towel, hold the base of the plate with one hand, and with the other flip the pan over so that the tarte is pastry-side down on the plate. Decorate with the spices, and serve with custard or whipped cream. A tart as dark, and as star-studded, as the midnight sky. This is best made in advance and left to set a little in the fridge before serving. Make the crème pâtissière according to the recipe (link above). Mix the lemon zest and Limoncello into it, cover the surface with cling and place in the fridge until cold. Make the pastry according to the recipe (link above), line the tart tin, chill it, then blind-bake it as described here. Set aside to cool. Put the gelatine into a bowl of cold water to soak. Put the frozen blueberries, lemon juice and sugar in a saucepan over a high heat. Stir until the sauce begins to bubble, then reduce the heat and simmer for about 5 minutes or until slightly reduced and the blueberries have lost their shape. Remove from the heat. Take the gelatine leaves (they should now be floppy and yielding) squeeze the moisture from them and add them to the blueberry sauce. Stir until dissolved, then allow to cool for about 10 minutes. Melt the white chocolate in a heatproof bowl set over a pan of simmering water. Use a pastry brush to paint the inside of the baked and cooled pastry case with it. Allow this to set for about 5 minutes. Spoon the crème pâtissière into the case and level it off. Stir the fresh blueberries into the blueberry sauce and stir to coat them, but don’t pop them. Gently spoon over the crème pâtissière. Finish the tart with gold stars and glitter, and allow the jelly to set for a few hours (preferably overnight) before serving. Forgive me but I couldn’t resist this ‘prostitute’s pizza’. When you share it with a lover, you’ll see that it isn’t a sordid thing at all, but a delicious, passionate pizza that is perfect after a bit of, well... Puttanesca was originally a pasta sauce, and one that I practically lived on when I spent a summer in Rome and Milan, working for a perfume manufacturer. The days were long and the offices were hot, but it was all worth it when I got to tuck into my favourite dish in the evenings. Thanks to the olives and anchovies, this has a bold and gutsy flavour, along with a lip-tingling spiciness from the chillies, which is never a bad thing. Turn out on to the worktop and knead for about 10 minutes until you have a smooth and elastic dough. Alternatively, knead for about 6 minutes in an electric mixer fitted with a dough hook. Allow the dough to rise in an oiled bowl covered with a damp tea towel for 1 hour or until doubled in size. When the dough has risen, place it on the large baking sheet and roll it out into a rough circle of about 28cm diameter, or make a heart shape, if you feel adventurous. Allow to rise for a second hour. Meanwhile, preheat the oven to 220°C/Gas 7. Make the topping by heating the olive oil in a saucepan over a medium heat and frying the onion for about 5 minutes or until softened. Add the garlic and fry for a further minute, then add the tomatoes, anchovies, black olives, capers and chilli. Allow this to simmer for 10 minutes, or until thick and spreadable, then take off the heat and set aside to cool slightly. Spread the topping over the risen pizza base, leaving a 1cm crust – there might be a few tablespoons of topping left for the cook to snack on – then slide the baking sheet into the oven and bake for 15–20 minutes or until the crust is crispy and the underneath is firm. Finish with a sprinkling of parsley and a grating of Parmesan, then cut into whatever size slices you can manage. The word ‘sherbet’ evokes memories of youth, but, ironically, I disliked sherbet as a child – I was a kid who needed a more toothsome, chewy sort of jelly sweet. This cake is perfect for baking with children, because the cake batter uses a ‘one mix’ method, so there is no need to go through the stages of making a cake, which can sometimes tire fickle little kids. And though it’s a simple cake to make, with a simple filling, the presentation takes it up a notch. This cake is a nod to all things youthful, but it is also absolutely acceptable at a sophisticated, child-free gathering. For the lemon topping, use a potato peeler to pare thick strips of peel from the lemons – if you get any white pith, scrape it off with a knife. Chop the lemon peel into thin matchsticks, then place in a small saucepan with 200ml water. Bring to the boil, then drain the water, place the lemon zest back into the pan with another 200ml water and repeat. Drain again then repeat – you should bring the lemon zest to the boil 3 times in total. Set the drained lemon zest matchsticks aside. Place the 100g sugar and 100ml water in the saucepan and bring to the boil until the sugar is dissolved, then return the lemon zest and allow to poach for about 5 minutes. Drain. Place the 75g caster sugar in a bowl and add the lemon matchsticks. Toss in the sugar then arrange on a baking sheet and allow to dry out for a few hours (overnight is better). Place the ingredients for the cake into a mixing bowl and beat together until well incorporated and smooth. If you have a freestanding electric mixer, use the paddle attachment. Divide the batter between the two prepared tins, and bake for 20–25 minutes, or until golden brown and a skewer inserted into the centre comes out clean. Remove from the oven and allow to cool slightly, before removing from the tins and turning on to a cooling rack until completely cold. Meanwhile, make the filling by whipping the cream to very soft floppy peaks. Fold this into the mascarpone along with the sifted icing sugar and lemon zest until smooth. Then quickly beat in the lemon juice – though don’t overbeat, as you don’t want the mixture to split. When the cake is cooled, and the candied lemon is dry, slice each cake in half horizontally so that you have four layers. Place one on the cake stand. Fill the piping bag with the filling and pipe little blobs around the edge of the cake, then a spiral of filling in the centre. Sprinkle over a third of the sherbet, then top with another slice of cake. Repeat this until you have four layers of cake and three layers of cream and sherbet. Sift a layer of icing sugar over the top, then scatter over the candied lemon matchsticks.